Heat oven to 375°F. Spray cookie sheet with cooking spray. Cut each loaf of dough crosswise into 6 pieces. Roll dough into balls; place on cookie sheet. Bake 12 to 16 minutes or until golden brown. Cool on cooling rack. Increase oven temperature to 400°F. In food processor bowl, combine red pepper, mango and jalapeño. Cover; process with on-and-off pulses or until mixture is finely chopped. In small bowl, stir together remaining 1 cup bread crumbs and melted butter until blended. 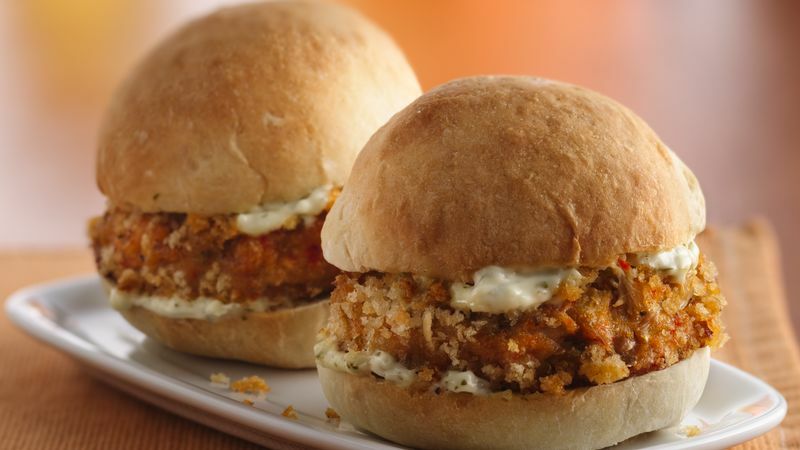 Using 1/4 cup crab mixture per patty, shape into 12 (2-inch) patties; sprinkle both sides of each patty with bread crumbs. Reshape each patty, if necessary. Place on cookie sheet. Bake 20 to 25 minutes, turning once halfway through baking, or until cakes are golden brown on both sides. Meanwhile, in food processor bowl, combine aioli ingredients. Cover; process until smooth. Cut buns in half horizontally. Spread aioli on cut sides of each bun. Place bottoms of buns on serving platter; top each with crab cake and top of bun.